To be an effective device for the treatment of a biliary obstruction, precise placement, high patency, and low migration are needed. 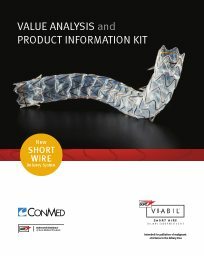 With its unique combination of features and benefits, GORE® VIABIL® Short Wire Biliary Endoprosthesis is the only fully covered metal stent with anti-migration technology proven to reduce the risk of reintervention. GORE® VIABIL® Short Wire Biliary Endoprosthesis is the only fully covered metal stent that has clinical data demonstrating long-term patency and lower risk of migration.